Existing process equipment are subject to various severe operation conditions and sometimes need revamping activities. 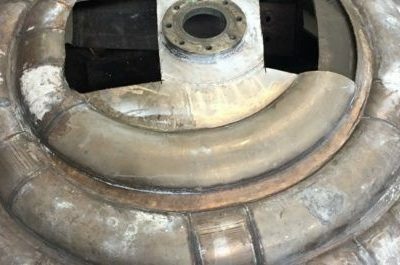 Maintenance teams sometimes detect leaks linked to corrosion phenomena and they are sometimes constrained to stop production in order to repair the equipment. 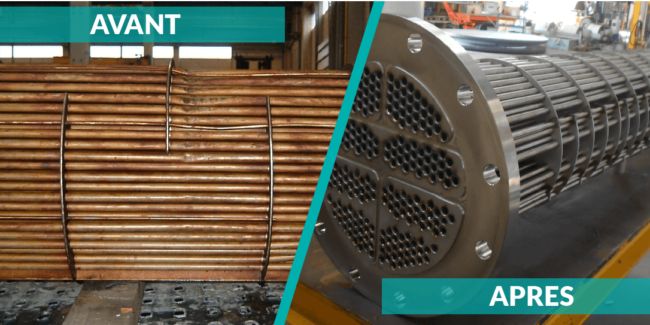 During the use, the shell and tubes heat exchangers are subjected to severe operating conditions that can cause leaks in the tubes resulting from corrosion. Then, it’s necessary to program a retubing operation to make durable the equipment. Moreover our permanent stock of stainless steel tubes and plates enable us to perform the heat exchangers retubing with the shortest delivery time in order to limit the production shutdown in factories. This retubing operations can be performed on mechanically expamded or on welded tubes. During heat exchangers using, it can be necessary to perform modifications on the equipment due to leaks or mishandling. The half pipe coil reactors operate with sever conditions which can accelerate corrosion phenomene and caused some leaks on the half pipe coil. The installation must then be stopped and a repair of the equipment has to take place. Labbe Company regularly proceeds to revamping activities of half pipe coil reactor replacement of half pipe coil head or shell. Totally independent for that kind of operations thanks to its 1000T of stainless steel plates stock and the internal control of cutting activities, dished head, half pipe coil and shell manufacturing, Labbe Process Equipment is the leader for this kind of operation and guarantees the shortest delivery time for intervention. In order to increase the longevity of columns, it’s sometimes necessary to change one or more parts of distillation equipment.